It’s been a busy week fiber- and yarn-wise for me, so I have plenty to share with you! • On Saturday I started and finished an accessory for Maisie. We’ve been watching college football, as is our custom in the fall, and Maisie has given me some strange looks when I cheer. I decided if she was able to wear team colors to help cheer the boys on, that might help. I couldn’t find anything fitting, so I just cast on, and my idea worked. Maisie wearing her new kerchief. Obviously, this piece wouldn’t need to be a statement of team pride, but in this case it is. Go Huskers! For me, it solved a bigger problem, too. I’d been wanting to knit something for Maisie, but I didn’t want to invest a lot of hours on something that she’d just destroy. And she’s warm enough with all that fluff that she doesn’t really need a coat, etc. 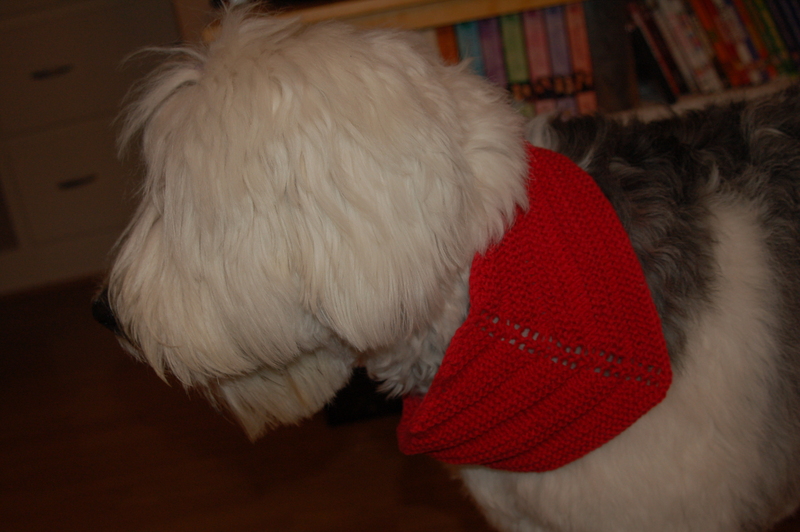 My Puppy Kerchief project page on Ravelry (with more photos). • On Monday I finally, for the first time, went to knit night (I think it’s actually called Sit, Sip and Knit — SSK — at this store). I’ve have the dates on my calendar for more than a year, but every time I convinced myself to make the trek, it was a holiday or something, when I know they’re sometimes closed. Well, notwithstanding Columbus Day, I went this week, and I had a good time. I plan to go back. • On Wednesday I got exciting knitting and book mail! 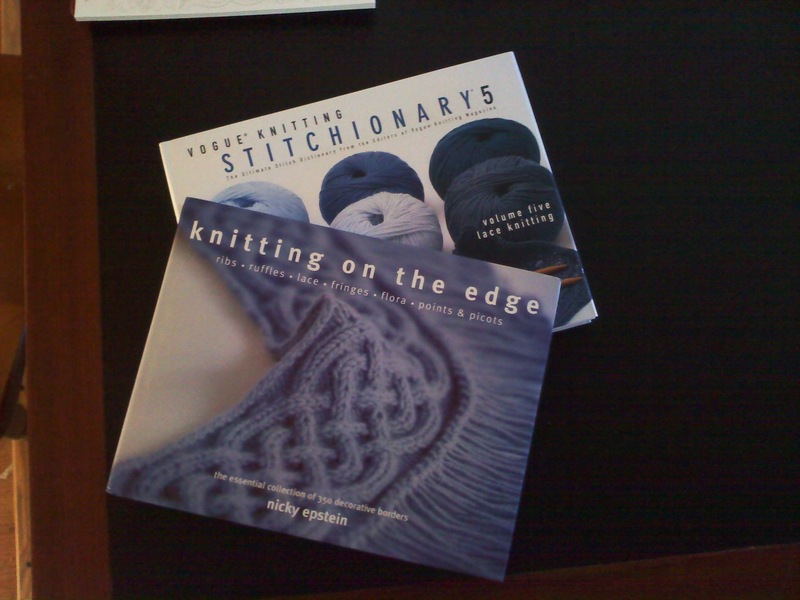 Knitting books in the mail! I’ve been deeply wanting these two books for what feels like ages. In reality it can’t have been that long, because Vogue Knitting Stitchionary Vol. Five: Lace Knitting only came out June 1. Knitting on the Edge by Nicky Epstein has been out a few years, but the point still holds. Regardless, I’m very excited to finally have both of these! • With the books came the long cables I need to continue working on the blanket I’m creating. So I should get back to the graph paper (Excel, I think, maybe) and math on that. 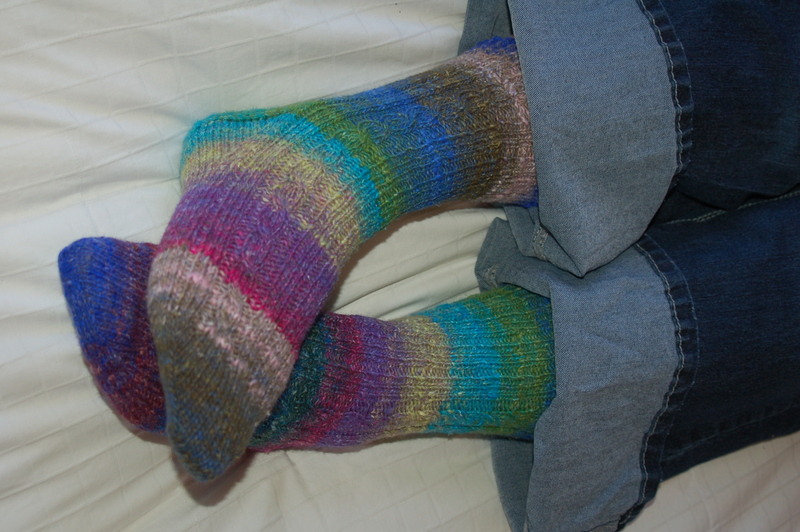 • I’ve been pondering making Iced (Ravelry link). If I do, I’ll likely make it in worsted/aran-weight yarn, reclaimed from a gray sweater hanging in my closet, rather than the bulky it calls for. And I think I’ll end up adding pockets, too. It would be my first time knitting pockets, but a cardigan is generally more useful to me with pockets. Based on the one tutorial I read, I think it wouldn’t be that difficult. 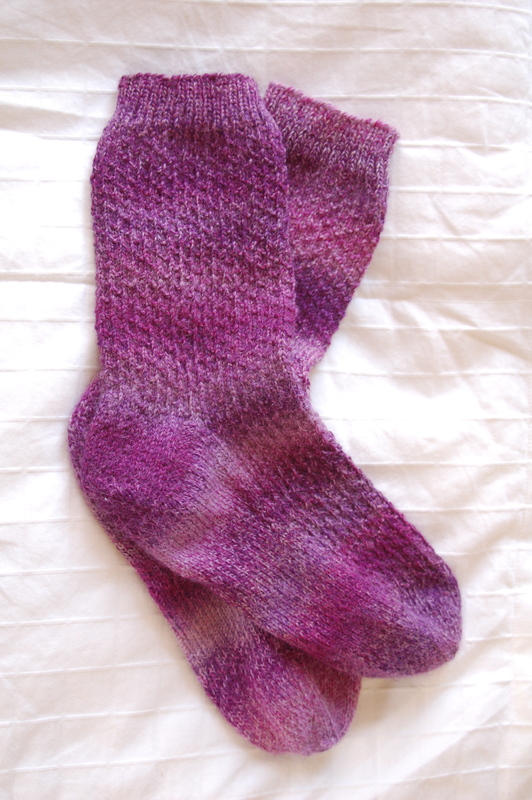 To see what other people have been working on this week, check out Fiber Arts Friday and FO Friday.